This is what my desk looks like right now. This is actually the "to be filed" side of my desk. 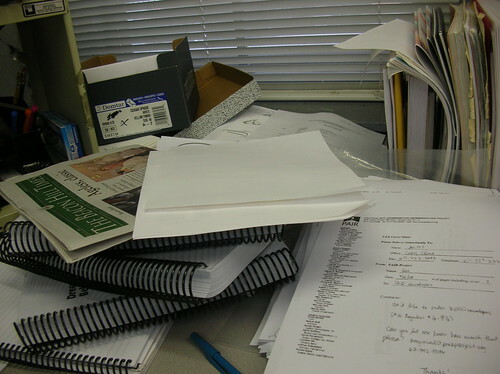 Once a job is done and I need to file the paperwork it gets stacked in a not-so-neat pile and forgotten about. I hate keeping paper files but I have to keep records and samples of jobs that we sent out to vendors, as well as proofs that have been signed off. I have so much filing to do, not to mention that our filing system is totally hopeless and filled with orders that go all the way back to probably 1987. Remember all this Allie?! What a mess. The problem is that there are basically 3 of us that run the day to day operations of this business. I am completely in control of the customer service side, my Dad runs production and my brother does all of the delivery, pickup, bindery, and the "etc." category. As the GM of the company, really I should have time to do all the necessary administrative stuff that needs to get done, but since I am the one and only customer service person, I spend most of my days answering the phones, helping walk-in customers, receiving all of the emails and web orders... I never get anything else done because I'm constantly being interrupted. I've been praying for a new hire for a long time now and if I can pull it off, we can get someone in here by winter. That may be wishful thinking, but I need the help!!! I'm also going to school on Monday nights for my graphic design certificate, I work Tuesday nights at the Y, Wednesday nights I work for an hour and then go to kickboxing. The first half of the week I leave the house at 7am and don't get home until 10. It's pure insanity. And so the blog gets neglected of course. Plus with all this madness I have no time to cook, nor shop and therefore am practically living off of the Whole Foods salad bar. Delightful. I'm also full of ideas as to how to evolve this blog so it's more than just a gluten-free blog. Now that I'm getting used to the lifestyle, I find it less and less necessary to blog about it since I'm really not doing anything blog-worthy in my food ventures these days. If I had more time... don't we all wish for that? I'm also going to start working on a completely new website for the business but that's going to take me a long time. I almost wish I had gone for my web certificate instead of graphic design since what they're teaching me now I pretty much already know, but oh well. I have learned a few new tricks of the trade so that's good. I just finished Photoshop class last night and next week we start Illustrator. That's the one I'm really looking forward to, I need help with a lot!! wow - sounds busy -- and I HATE filing as well, so boo to that. sounds like some possibly exciting things may be going on -- what's this epiphany all about? ?